Curious Moonlight has its first review already, and it’s a good one – better than good. I am thrilled, and this has inspired me to push on and start a second in what could become a series. 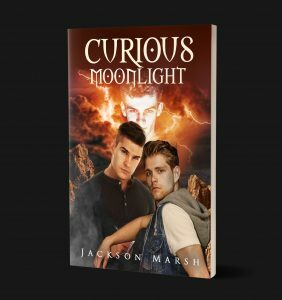 ‘The Curious Moonlight Mysteries’ sounds like an excellent title for such a series. Our central boys, Luke and Peran (one sceptical, one a believer) set about solving unsolved hauntings but without using modern techniques. They rely on researching past stories and events, local history and records to piece together a) what happened to the presence haunting the properties, and b) why they should be hunting them. Then, they are able to figure out how to end the events. That’s basically what happens in Curios Moonlight, but in the second part (plotted and 20,000 words written), they travel further afield to solve a mystery and, if successful, get paid. Could be fun and the start of something longer-term. You can read the review here (Amazon.co.uk but it’s also on other Amazon sites).